Our 7th Mashfest is coming up Sunday, August 25th. The Summer Mashfest is held at Mint Tea (2014 Main Street, Vancouver) from 4 pm to 8 pm. 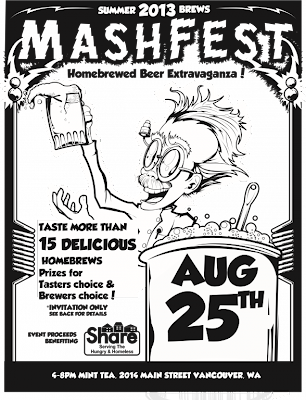 Mashfest is a "Homebrewers" festival, where 15 homebrewers will be pouring free samples of the beer they have made at home. As an attendee, you get to taste their beer and discuss with the brewers how they made the beer. You then get to vote for your favorite beer, determining which brewers get the cool prizes! There are 3 People's Choice Awards, and the brewers get to vote too, giving out 3 Brewers Choice Awards! 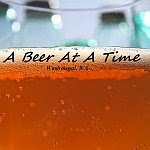 As per Washington law (passed with the assistance of homebrewers in 2008), this event is by invitation only, we are NOT allowed to sell tickets at the door on the day of the event. This is an awesome event, and a great place to sample other homebrewers beers! The brewers are bringing their best beers, so the quality is excellent, and a great place to try different beers. You must be 21 to attend, sorry, no children. Due to space limitations, we limit attendees to 120. The last Mashfest sold out about a week in advance, so don't wait till the last minute to pick up your tickets! Tickets are $15 per person, and you can pick up your tickets at Bader Beer & Wine Supply (711 Grand Blvd) Loowit Brewing Company (507 Columbia) or at Mint Tea (2014 Main street, Vancouver), or you can buy them online at Brown Paper Tickets. Click here to purchase your Mashfest Summer 2013 Tickets.